Once you try the Serta iComfort series for yourself, you’ll understand why it’s often referred to as one of the most advanced sleep systems available on the market today. And best of all, it packs its advanced mattress technology into two options. Choose from the Serta iComfort all-memory foam mattress or the hybrid style, which combines the best of memory foam with next-generation innerspring coils. Can’t wait to try one? Stop by a Mattress World Northwest showroom today! So you’ve heard some great things about memory foam and you’re excited to try it for yourself, but it’s got a reputation for heat retention. No one likes the feeling of being uncomfortably hot while trying to sleep, and so Serta fixed it with their TempActiv cooling technology. TempActiv technology features millions of tiny gel beads that regulate the temperature of the mattress by redistributing heat away from your body. These, plus another layer of gel, also add to the superior support of the mattress. 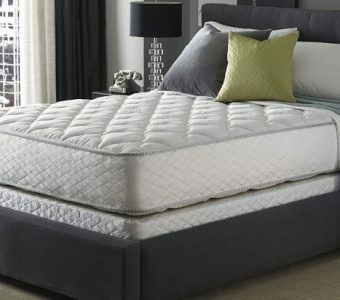 The Serta iComfort series boasts the innovative Cool Action Dual Effects material, which Serta describes as the world’s first memory foam that brings together the company’s original MicroSupport gel and its revolutionary new design, the MicroCool+ gel. The result is a product with 25% more gel than Serta’s original Cool Action gel memory foam bed. Serta has thought of everything for its iComfort series—from the core to the cover. The ThermoCool yarn fabric cover is so luxuriously soft that you’ll think it’s a shame to cover it with sheets. It’s designed specifically to support the heat regulation function of the gel beads. Plus, it features TENCEL fibers, which offer superior resistance to mold growth, bacteria, and even dust mites—letting you rest easy at night. Want the perks of memory foam, but with extra support? Serta’s got you covered with the iComfort Hybrid Sleep System. It includes everything you’ll find in the all-foam mattress, like Cool Action Dual Effects, but with the addition of Duet Coil. Duet Coil is Serta’s next-generation coil-in-coil support system, featuring individually wrapped coils that are strategically positioned to cradle each sleeper with superior support. In other words, it minimizes motion transfer, so that when your sleep partner moves, you won’t. The exceptional posturized design will contour to every inch of your body for instant comfort and support. There’s a perfect mattress out there for every body—it just might take a little trial and error to find the one that’s best for your body. At Mattress World Northwest, our sleep specialists are committed to helping you find the best bed for your needs and sleep style. We’re proud to carry premium Serta mattresses, along with other top brand names like Sealy, Simmons, and Aireloom. Stop by a showroom near Portland today, and be sure to check out the Serta Motion Perfect Adjustable Base!